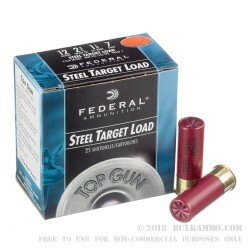 A very mainstream steel target load for the masses. 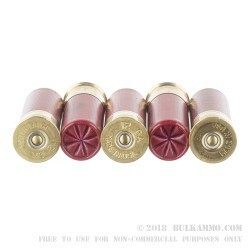 This is a well-priced steel shotshell that performs well and doesn’t disappoint like other steel loads can sometimes do. 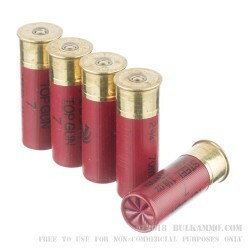 These are purpose built for clays, but they can be used for most any short range shotshell duties, including small game, like squirrel or rabbit. The #7 shot could be used for short range waterfowl work, but it may not perform quite like you want it to under certain difficult conditions. The load is a 2 ¾” shell with a 1 1/8 ounce load of steel #7, which is a potent payload for close in work, which is where this shell will excel. The lightweight steel shot will have some drag effect so plan accordingly. 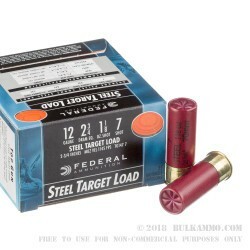 But note: Federal did try to compensate for the lack of lead by upping the cup weight, the powder load and the shot size (most target loads are going to be #7.5 - #8 - #9 shot generally). For the money, this 250 round case load of ammunition represents a fantastic deal for the shooting public on as shell that couldn’t be more popular than it already is.